Looks pretty, yes? But this idyllic start and finish belied a truly murderous run. This running gig certainly takes you to uncharted territory. Such as teeny, tiny Henniker, NH (pop. 4,850) – hardly a tourist draw, but a lovely town nonetheless. 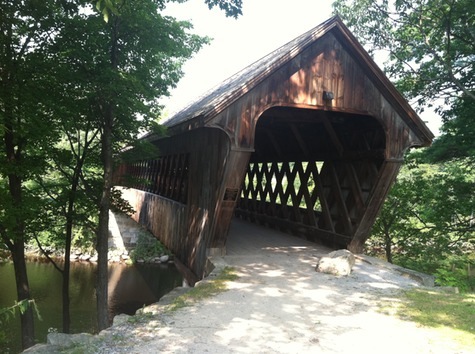 The Covered Bridge 5K supports the athletic programs at New England College, whose campus hosted the race. It was a small event, with fewer than 100 runners, that started under the covered bridge from which the race gets its name. I was convinced I really would be last this time, as I’d never run among such a small field. That turned out to be the least of my worries. The run started off as these things usually do, with me breaking into my customary shuffle in order to conserve energy. But that soon went out the window when, about 10 minutes in, there loomed in front of me the BIGGEST HILL I HAVE EVER SEEN. OK, that’s probably overstating it, but when you’re already challenged in the breathing department, a hill is not what you want to encounter. It stopped me in my tracks and I joined the rest of the folks in my pace group in ascending at a walk for what seemed to be an eternity. In fact, it was about a mile. As I trudged along, sweating provocatively and cursing with every stride, Hubby was at the front of the pack wondering if this race was going to be a marriage-ending affair. If I could have found a lawyer along the way (I was certainly going slowly enough), I would have. Pint glasses to the rescue! Although the last mile took a turn for the better as the uphill turned to a down, the damage to my pace had been done. When I crossed the finish line, it was in my slowest time and with my reddest face yet. I need to figure out how to run up a hill. However, you’ve got to love an event that features pint glasses as a prize. Better than medals by far. We wound up with two: one legitimately earned by Hubby; one randomly won by me. Yes! The aftermath: Bananas! Pint glasses! This entry was posted in Fitness, Running, Sports and tagged 5K, asthma, New Hampshire, road race, running uphill. Bookmark the permalink. Oooh that bridge looks scary! Good for you! Also, this entry for some reason showed up in my Google reader. I didn’t realize it was from September. Embarrassing! !